The summer is almost over – at least for the school kids in California. My kids start back on the 17th of August. Traditionally, we always take a trip right before they go back to school. It is the time to really be together, have adventures and relax. This year we decided to divide our holiday up into two segments. The first segment we arranged to spend time down in Los Angeles for a couple of days. There we were hoping to see the sights, eat some really good food and do some interesting things. The second segment was to involve taking the dogs, Maxie and Mikey over to the coast – because they never get to come on trips with us. We left rather later than hoped, because I decided I had to clean the house. We have someone staying with the dogs and I didn’t want him to stay in less than a spotless house. I also don’t like coming back from a trip to a dirty house. That kind of negates the good feeling of the vacation, instantly (well, that and the mound of laundry that comes back with us). We hit the Grapevine in relatively good time. The Grapevine is the strip of the road that goes up over the Tejon pass down into Los Angeles. It’s a dicey piece of road even in the best weather. It seems as soon as all drivers enter the Grapevine they transform into Mario Andretti wannabes. Everyone was going 75 miles and above per hour around these curvy roads, four to six lanes of traffic barreling along until suddenly, erk, boing – we all came to a screeching halt. And that is where we stayed for the next 90 minutes. We were so stopped, people were getting out of their cars, visiting with friends. The word was a wildfire had been started by a car accident. That actually wasn’t true at all, but the rumor itself however spread like a wildfire. I sat and studied the back of this camper the entire time. Turned out the rather reckless driver we had seen earlier had cleverly flipped his truck and closed all lanes of traffic. The traffic finally began moving again, but apparently no one had taken anything away from the lesson learned from our friend in the SUV. We arrived in Marina Del Ray unscathed and ready for our ensuing days of adventure. Have a wonderful safe trip and do your best to avoid the reckless drivers. Take care. They are a crazy bunch of drivers down in LA. But nothing beats Phoenix drivers – they verge on suicidal. Thank-you!!!! My husband and I were stuck in city traffic over the weekend (taking a day trip). For some reason, that kind of traffic kicks in my claustrophobia. I can’t imagine not moving for 90 minutes. Glad you arrived unscathed and hope to hear about your adventure. Thank-you my friend!! 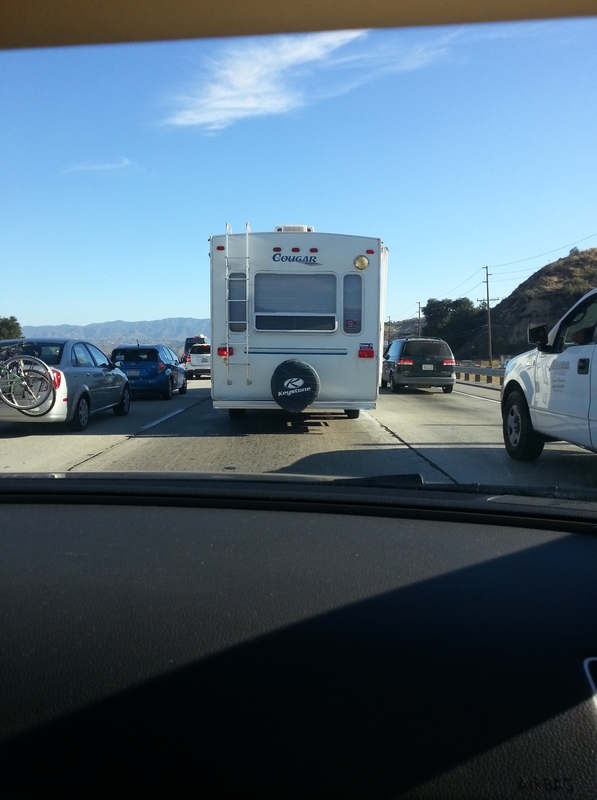 That’s true – I did feel claustrophobic because all I could see was the back of that bumper – it was driving me nuts!!!! Yes, too bad you can’t go with disposable clothes, so there would be no laundry when you came home. That would be brilliant. I was shocked to see the posted speed limit in Colorado was 75 mph, S.D. Only 65 here in New York. People were driving way fast. 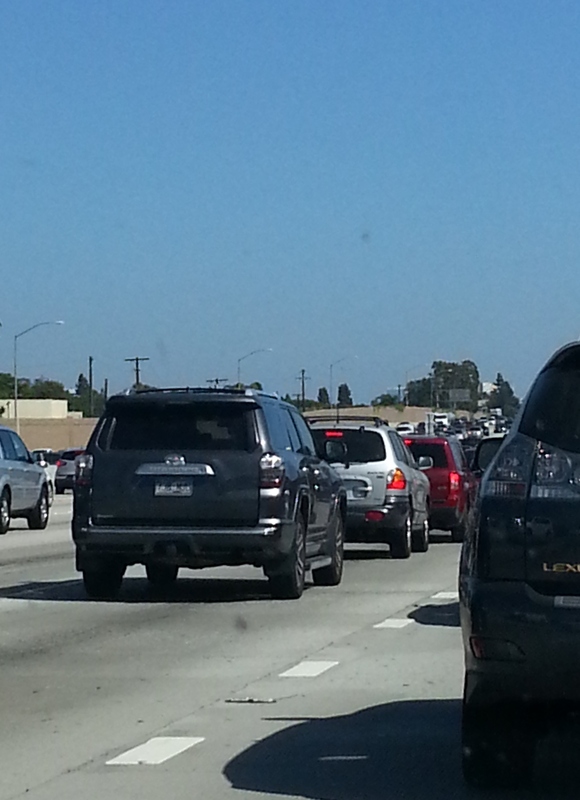 I do remember from my San Diego to San Francisco driving vacation with MDW Karen: Freeway traffic, lots of it. Wow, I didn’t realize the speed limit was so high out in Colorado. The modus operandi in LA seems to be – go at neck breaking speeds , screech to a halt, then go at neck breaking speeds again. Seems to me if they leveled it out (in LA), and weren’t so spastic about the whole thing the traffic would flow much smoother. When that happens in NYC, they call it “rubber-banding,” SD. See that, even an official name for the speedy-stop-speedy behavior for the helicopter traffic radio guys as I recall from my days living down there. That’s a good term – drives me to insanity – whatever they call it.